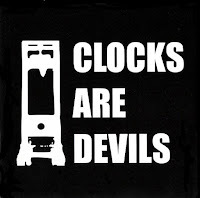 As of today I put the entire Clocks Are Devils discography up on our BandCamp page for download for free. Unfortunately BandCamp allows only 200 free downloads per month. So, if you'd like to download the albums you should get on that now otherwise you'll be stuck streaming them until next month. At this point you may be wondering who Clocks Are Devils are…don't worry, just keep reading. 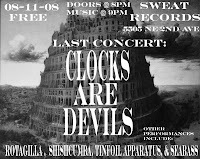 Clocks Are Devils was a band I founded along with my friends Louis Salgar and "Firebird" Mike Rodriguez, but before we start that story let me give you some background info. 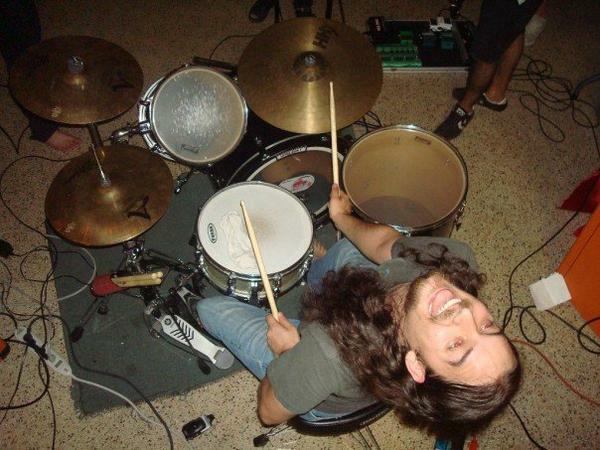 In 2004, I founded a band called The Great God War with "Firebird" Mike Rodriguez and Albert Diaz. The Great God War evolved over time eventually settling with a lineup consisting of "Firebird" Mike Rodriguez, Albert Diaz, Louis Salgar, and myself. We were loud, angry, pissed off kids having fun. Our group went from practicing in Albert's garage to opening for groups like Ion Dissonance, Dead to Fall, and The Absence. As time went on the decision was made to end The Great God War and work on new projects. From the remains of The Great God War, rose a new juggernaut that became known as Clocks Are Devils. Consisting of "Firebird" Mike Rodriguez, Louis Salgar, and myself. Clocks Are Devils spread like wildfire leaving a trail of empty bottles and broken hearts. Formed in the fall of 2006, Clocks signed to the Kentucky-based indie label Mayday! Mayday! Records less than a year later. Shortly thereafter, Clocks released a short run split cd with 8085. The split cd was highly received and critically acclaimed leading to a tour featuring both Clocks Are Devils and 8085. Following the success of the split cd and subsequent tour, Clocks Are Devils immediately began working on new material for a highly anticipated full length and accompanying tour. After writing all the material, Clocks began recording the new record in the fall of 2008 while simultaneously playing local concerts and touring. After finally completing the full length and having the cd mixed by John Nuñez (Torche and Shitstorm) and mastered by Rory Willis (Bears!) Clocks Are Devils began dissolving. There weren't any fights or any arguments, to put it simply other priorities and responsibilities began making getting together difficult. 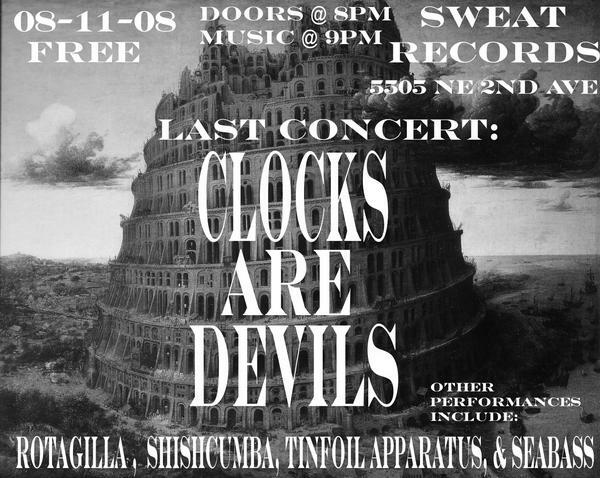 It was eventually decided that Clocks Are Devils would perform for the last time August 11th, 2008 at Sweat Records. After Clocks Are Devils ended we had originally planned to release the full length, however coordinating things together became very difficult due to everyone's schedule. Eventually I decided to just put the previously unreleased full length onto BandCamp. Until today, this album has only been available for streaming, meaning the only way you could have had the release in your hands was if it was given to you directly from one of us. However, that changed today and now you can download it all right here.